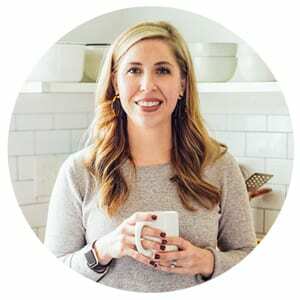 Live Simply was created out of a passion to share my family’s journey to simplify real food and “natural living.” Never once did I think that I would be sharing a photo of my closet and lint-dusted shirts, or talking about fashion. I’ve found that our journey to simplify has affected nearly every single aspect of our home, including my closet. So here I am, writing about clothes once again, and, more importantly, how I’m simplifying my wardrobe. 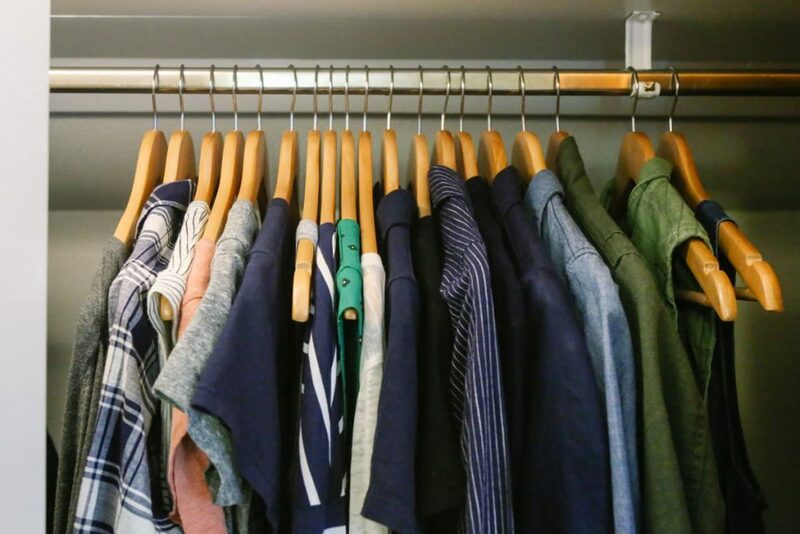 Last November, I shared that I decluttered my closet in the name of simplifying. I was planning to only wear a limited number of clothes (43 items to be exact). The whole concept is called a capsule wardrobe. Since that post, I’ve received questions about my experience with a capsule wardrobe. Today is finally the big reveal: Was my capsule a huge success, or was I splurge shopping at Target by month two? First, let’s recap the capsule wardrobe concept. The capsule concept was created by Susie Faux, a London Boutique owner in the ’70s. According to Faux, a capsule wardrobe is a collection of a few essential items that work together and don’t go out of style. Most capsule wardrobe bloggers recommend choosing a set number of clothes you’d like to include in a wardrobe. The items should be chosen according to season, and only worn for that particular season, before transitioning to a new capsule. The clothing items chosen should include tops, bottoms, dresses, outerwear, and shoes. This number doesn’t include a fancy dress for weddings, or the lounge clothes you love to wear while enjoying your favorite Netflix show. Quality Over Quantity: Instead of focusing on buying as many clothes or shoes as possible, my focus is on purchasing what I need, when I need it, and only quality items that will endure the test of time. 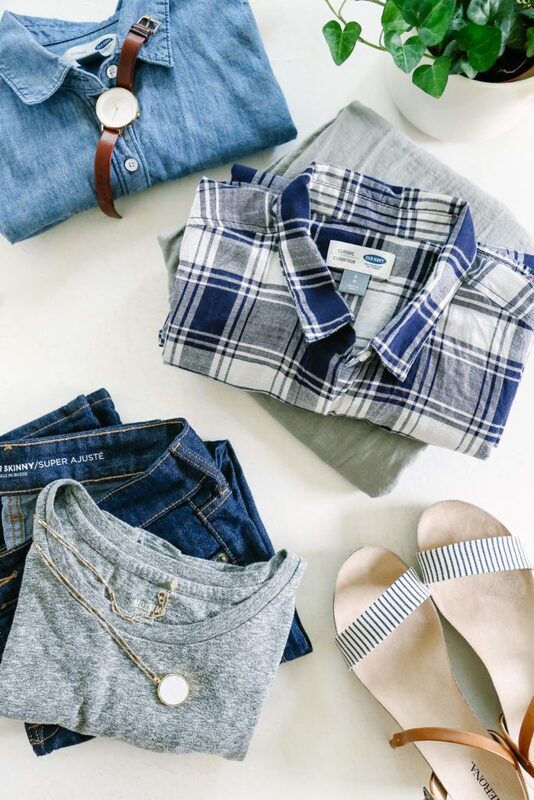 Purposeful Choices: The concept of a capsule wardrobe is to only include quality items that will work together in multiple ways, creating multiple different looks with just a few basic essentials. No Shopping: Once my capsule pieces have been selected, I’m not allowed to shop again until the next capsule season. Some clothes are carried over between capsules, while others are tucked away in a Rubbermaid container until that season returns. Color Scheme: This rule is essential to making a capsule wardrobe work. For me, this means making sure the clothes in my capsule work together according to style and color. In the images below, you’ll notice the various combinations that are possible with a few basic capsule pieces. In the first photo set, I started out with a gray shirt and dark jeans. On another day, I paired the same combo with a linen jacket to slightly change the look. In the second set, the jeans and linen jacket are kept in the mix and a navy shirt is added with a new necklace. In the last photo, the pants and sandals are swapped out for an everyday, brown sandal and linen pants. I truthfully wasn’t sure what I would think of a capsule wardrobe. After cleaning out my closet last November, I decided to keep all of my clothes that once hung in my closet just to be safe. I figured the clothes would rescue me from the crazy capsule idea if I ran out of outfits to wear. Over the last five months, I never once had to touch the extra clothes that once hung in my closet. In fact, I found that 43 pieces of clothing was too many. I only wore about 30 pieces of clothing over the last five months, and five different pairs of shoes. I’m sure that sounds incredibly limiting, but it wasn’t limiting or constricting at all. I never once felt like I didn’t have anything to wear, which is how I felt before my capsule wardrobe experiment. I truly believe the reason for this change is based on one simple word: intentional. For the first time ever, I was intentional about the clothes in my closet. My capsule wardrobe experience has been incredible! So incredible that I’ll never go back to a closet full of clothes, or impulse shopping. At the moment, I just packed away my fall/winter capsule and pulled together my spring/summer capsule. Lesson 1: Building a quality capsule wardrobe isn’t cheap (in the beginning). The whole idea of rotating a limited number of pieces in my wardrobe sounded like a very budget-friendly approach last November. The truth is, building a capsule wardrobe isn’t cheap! The emphasis of a capsule wardrobe is on quality pieces of clothing that work well together. I personally didn’t have a closet that resembled these two characteristics (and that’s probably the reason I was constantly frustrated with my wardrobe before my capsule decision). In order to build a capsule wardrobe, I had to spend money upfront, and that was a hard decision to swallow. I didn’t purchase everything that would have been a great addition to my wardrobe last November or this spring. Rather, I chose the necessary items that I could afford this year and focused on quality pieces that I love. I have a few items, like a pair of leather Lucky booties, that I plan to save for and add to my capsule next fall/winter. With that said, I believe a capsule is a very budget-friendly concept in the long-term. In the beginning (which I consider to be the first year or two), the goal is building a capsule, but once it’s built, the goal is to simply reuse the capsule each year (for that particular season) and add a piece or two if needed. Lesson 2: A capsule wardrobe helped me get in touch with my style. A capsule wardrobe is about being intentional, which has helped me discover what I love to wear (AKA: my style). When I started building my fall/winter capsule, I wasn’t sure about my style, so I based many of my decisions off the recommendations of capsule wardrobe blogs. Over the last five months, with my limited wardrobe selection, I’ve noticed that I gravitate towards certain colors, fabrics, brands (not because of the brand, but due to the way the piece fits) and styles. For example: I love a dark pair of jeans, comfy pants, collared shirts, and navy anything. With this in mind, building my spring/summer capsule has been much easier. Lesson 3: The goal is intentional progress, not perfection. If you’re on the fence about cleaning out your entire closet and only keeping a few intentionally-chosen pieces, my best advice is to just do it! You’ll learn so much during the process, and slowly you’ll learn more about what you love and how to make your future capsule wardrobe even better. The goal is intentional progress each season, not instant perfection or mastery. Lesson 4: Less is more. Owning a limited number of clothes has allowed me to have more time in the morning (I’m not scratching my head every morning and wondering what to wear in a packed closet full of random pieces), more time on the weekends (I don’t have mountains of laundry anymore because I wore 50 pieces of clothing in one week, and I’m not spending my weekends shopping for new clothes that I’ll probably never wear), more creativity and inspiration with my wardrobe (I’m excited to get dressed every morning with the clothes that I love and intentionally selected), and more contentment. Less truly is more! Finally, here’s what I pulled together (from shopping my fall/winter capsule and also intentionally shopping in stores) for my spring/summer capsule. Shirts: 1 button down jean shirt, 1 navy polo, 1 white button down shirt, 1 navy and white plaid shirt, 1 white cotton shirt with embroidery design, 1 cream light-weight long sleeve shirt, 4 plain cotton tees (white, gray, navy, black), 2 linen tees (gray and white stripped, and blush), 1 gray tank top, 1 navy and green silk shirt. 1 navy and white stripped 3/4 sleeve shirt. Dresses: 2 button down shirt dresses, 1 black linen short sleeve dress, 1 sleeveless jean dress. 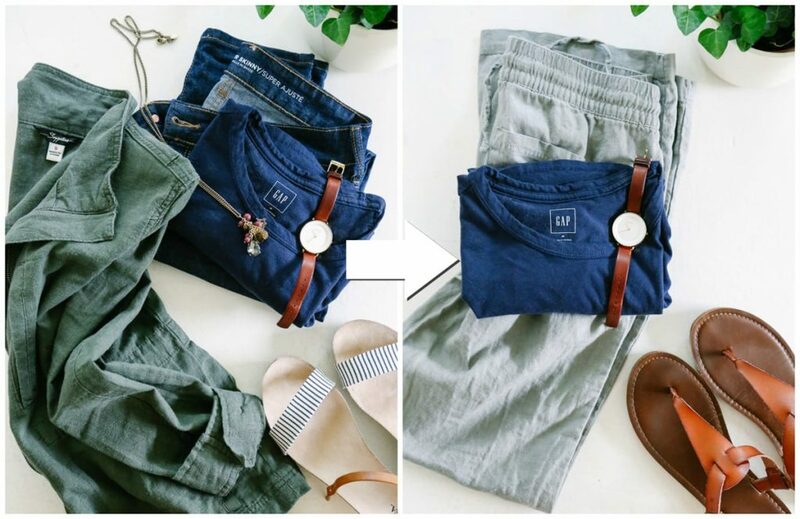 Pants/Shorts: 3 shorts (blush, khaki, navy), 2 light-weight jeans (dark wash and light wash), 1 cotton navy leggings, 1 khaki pants, 1 olive green linen pants. Jackets/Cardigans: 1 light-weight gray 3/4 sleeve cardigan, 1 army green linen jacket, 1 army green cotton vest, 1 navy linen blazer. 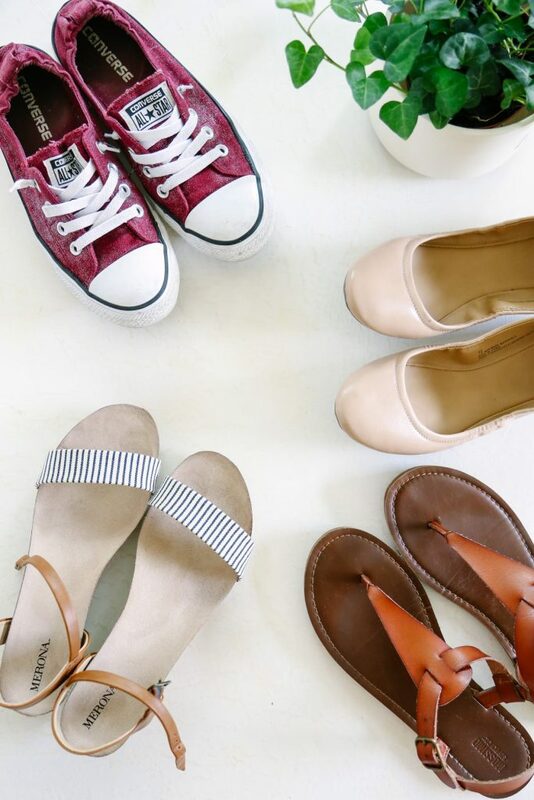 Shoes: 1 cream flats, 1 converse slip-ons, 1 dressy sandal, 1 everyday brown sandal. Total spring/summer pieces: 34. This number doesn’t include underwear, a set of workout clothes, pjs, a pair of yoga/couch pants, or jewelry. I’m planning for this capsule to last until late July or early August, and then I’ll create a mini capsule to last until the first signs of fall weather. 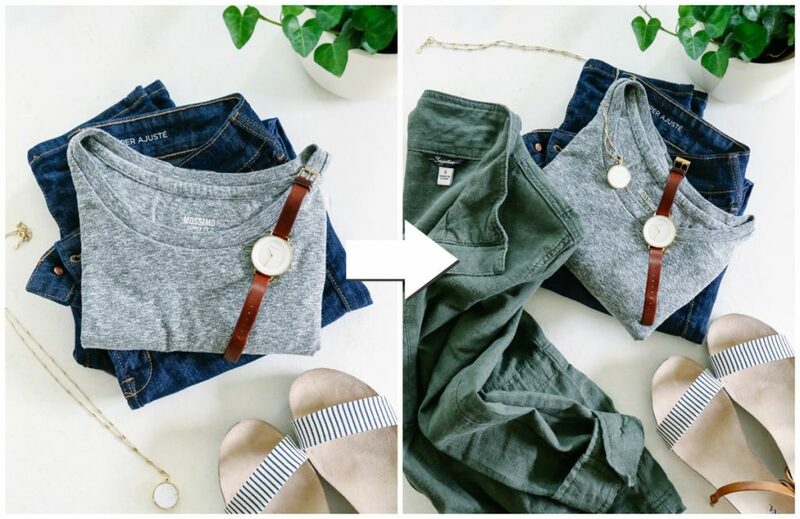 If you’re interested in getting started with a capsule wardrobe and simplifying your closet, I recommend checking out the blog Un-Fancy (use her capsule wardrobe planner) and my building a capsule wardrobe post. I love your capsule, Kristin! I have been doing a 40-piece wardrobe since January of last year, and it has been really amazing. It does take some time to figure out what pieces work, and which ones you gravitate to– but those staples have made my mornings easier and kept my shopping cravings at bay! I like the concept of a simple and easy to wear closet with minimal pieces and exponential options. A simple life in contrast to all the craziness that is going on in the world. More time to focus on my kids and the One who created me. Absolutely, Tina! I love my capsule for the exact reasons you list–it’s such a time-saver so I can focus on what’s important :). I had to giggle when I saw the main photo for thus post! I’m currently wearing that exact same blue/white plaid shirt from Old Navy! I have recently transitioned to a capsule wardrobe. My biggest fear was getting tired of wearing the same clothes all the time. But it’s the opposite; I always feel comfortable and good about how I look! Lol, that’s awesome, Katelyn! I completely agree. I felt like the same clothes would get old fast as well, but I love the way everything looks together. how long does each season last? Also, I tend to wear my few favorites for a few months naturally but I am tired of them by the time the weather changes, are the different capsules of clothing suppose to last several years or just through the season? Plus I’m kind of tough on clothes, but that just might be that they are quality pieces. I enjoyed this post. I’m really interested in trying out a capsule wardrobe, now that winter is nearly over, yay (I’m in Australia)! You spoke about having less laundry– how does it work though? Do you wear some clothing more than once or twice? I think it’ll be tricky for me working in an early childhood setting with paint, glue, sand and general grub, but I’d love to hear how you cope with laundry! Hey Dee, When I had a ton of clothes in my closet, I found that I changed my clothes sometimes multiple times a day. I think this was because I just didn’t like a lot of the items I had, because I would just purchase clothes when they were on sale versus actually being intentional about the purchases. Owning less clothes and purposely picking out the pieces meant that I loved what I had on, and didn’t change over and over again. I’ve also learned how to care for items like jeans, since I need them to last forever. This means I wear them multiple times before washing them. Hope that helps! Love this! Wish there was a full photo spread, but your article is very helpful! Hey Rochelle, Thank you. Yes, I need to work on that! Can’t wait to see photos of the spring capsule wardrobe! Thanks, Melissa! I need to work on putting together a new post :). I am one year into a capsule wardrobe and I disagree that it is expensive. Admittedly I started with a lack of clothes rather than an excess (following a diet) but I have found that it was easy, on the rare occasion when I need extra, to purchase it at a reasonable price (I’m not into “brands”). By buying the extra things I need slowly, it has been quite easy to thoughtfully add to my clothes. Thanks for sharing, Lucy! I’m so glad the process hasn’t been expensive for you.